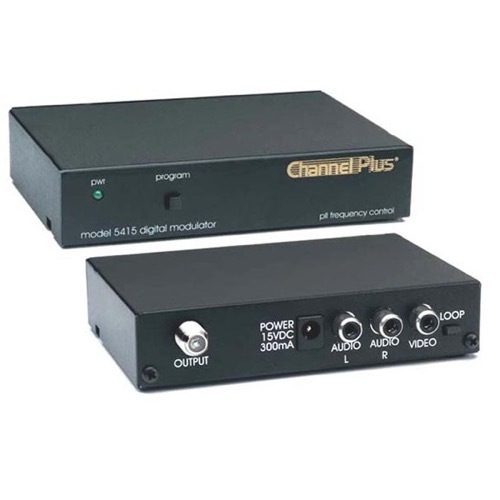 The Model 5415 One-channel Video Modulator has the same output power as the rest of the 5400 series, but it is a quarter of the size. Video and stereo audio inputs are modulated to a programmable TV channel (stereo audio is converted to monaural audio after modulation). The Model 5415 modulator offers video loop-through. A jumper on the Model 5415 terminates the video input at 75 ohms. When the jumper is removed, the input can be looped using a "Y" adapter to feed the video to a local monitor or VCR. Creates a TV channel for a camera or other video source.